Witness a grand display of illusions and magic by the Great Albini in the latest slot from Microgaming, complete with mystery boxes, wilds, and free spins. Huge spotlights illuminate the sky while the crowd goes wild as a luxurious limousine approaches the world-renowned theatre. With a puff of sparkling purple smoke, the Great Albini suddenly appears along with his beautiful co-star Lily by his side as they enter the theatre of dreams to hypnotize their audience with a phenomenal display of illusions and magic. 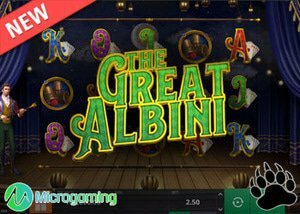 Developed by Microgaming online casino software, the new Great Albini slot offers a mesmerizing show filled with innovative features and glorious rewards infused into its 5x3 reel structure that boasts with 25 non-adjustable paylines. You will also be treated to a terrific variety of bonus features, including Lily Wild symbols, Free Spins, and a Mystery Box feature along with a 1,000-coin jackpot prize up for grabs during the base game. The big sign, with the word 'Wild' written across it in gold, will act as your wild symbol, replicating all standard symbols to form a winning combination except for the Lily Wild symbol, the Free Spins bonus symbol and the Mystery Box symbol. Please also be aware that the wild symbol will only make an appearance on reels 2, 3, 4, and 5 to assist with a win. The Great Albini poster will represent the scatter symbol on the reel set and if you manage to display a minimum of three posters scatter symbols on reels 2, 3, and 4, you will be awarded 12 free spins. During the free spin feature, the reel set will increase in height, producing a whopping 50 paylines to further increase your chances of winning big. In addition, you will also be able to trigger the Lily Wild feature within the free spins round which can be achieved when you land Lily on the second, third, and fourth reel. Once activated, Lily will expand to cover the entire reel, acting as both a 2x multiplier and a wild symbol, and will grant free respins until no more winning combinations are formed on the reel set. If you are impatient and want the free spin feature to trigger immediately, you can do so by purchasing 8, 10, or 12 free spins when you utilize the orange box on the betting platform which will cost 100x, 125x, or 150x your total bet size. The new Great Albini slot also comes equipped with a fascinating Mystery Box feature which is triggered when you land a full stack of mystery box symbols on the third reel. Once it's triggered, you will receive 3 respins while the mystery boxes that triggered the feature will remain in position. Should you display more mystery boxes during the respins, those boxes will also be locked in place while the respins reset back to 3. Once the respins are depleted, the mystery boxes will transform into standard matching symbols to potentially provide an extraordinary win. The Great Albini slot impresses with a decent selection of theme-related symbols to further enrich the quality of the slot. The Great Albini himself will provide the biggest jackpot prize in the game worth 1,000 coins when five are displayed on a winning payline. He is accompanied by his beautiful co-host Lily along with a yellow canary, a set of knives, and a bunch of lucky cups. You will also be able to form winning combinations by using red aces, blue kings, purple queens, green jacks, and orange tens. Like most online slots from Microgaming, the new Great Albini slot offers 25 non-adjustable paylines. However, the slot still provides loads of flexibility in terms of betting options as there are loads of bet values to choose from. You can start your magical journey with the Great Albini from as little as $0.25 a spin or increase the total bet size to a maximum of $50.00 a spin for bigger rewards. The new Great Albini slot is regarded as a medium variance slot that boasts with a 96.60% return to player ratio. The slot is available at all Microgaming casinos from January 2019. We suggest that you play the new Great Albini slot at Jackpot City Casino where you'll be treated to our exclusive offer of 15 no deposit free spins along with a further 350 free spins on your first 2 deposits.